Home • Blog • More news from inside…Chibundu Onuzo at a prison reading group. 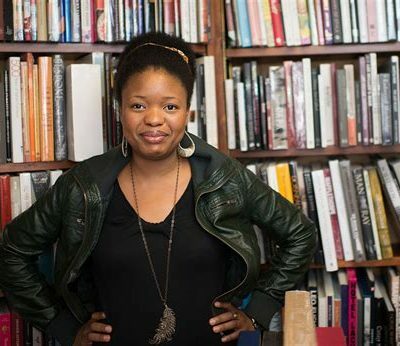 More news from inside…Chibundu Onuzo at a prison reading group. Chibundu Onuzo’s The Spider King’s Daughter is a first novel of degrading poverty and fabulous wealth, laced with vigorous dialect, and set in her native Nigeria. 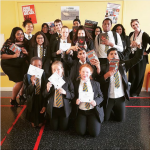 Readers at an HMP were lucky to have an author visit from Chibundu Onuzo recently, organised by the Librarian. 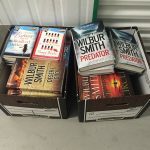 Support from Give a Book provided 25 copies of the novel for readers throughout the prison. This was a lively and enjoyable event, with a large group of readers who had really engaged with the novel, and found its story of the relationship between a street hawker and a millionaire’s daughter fascinating and absorbing. It’s a novel which opens your eyes to the extremes of Nigerian society, from the Louboutins and swimming pool lifestyle of the super-rich to the subsistence level existence of the very poor. There are fascinating glimpses of West African life – the food vendor who keeps pieces of fried meat in a secret compartment of her bra for favoured clients, the wealthy teenagers who are confident their fathers will pay someone clever to sit their entrance exams for Yale. As well as facing really in-depth questions (at one time she said to one questioner, `You know this novel better than I do!’) Chibundu Onuzo read several hilarious extracts featuring the `pidgin’ which makes this novel so distinctive. For those familiar with it – quite a few in the audience – this sense of a known place was what made the novel such an enjoyable read; others, like me, found some of the dialogue strange at first. But it’s Chibundu Onuzo’s skill at dialogue which makes The Spider King’s Daughter so rich. And I learned quite a lot: that women in Nigeria are called `Aunty’; older women would be `Ma’; you never address your parents by their first names. Conversation on topics like this went on long after the formal question and answer session was over, and Chibundu Onuzo stayed for a long time chatting with the audience. All the book group members and other readers at the prison are really grateful to Chibundu for her visit and for providing such a lively afternoon. 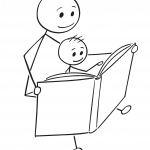 The reading group is part of the Prison Reading Groups (PRG) project. Now please go back to Give a Book.